Girl falls from 9th floor of apartment complex in Netanya. Medics forced to confirm her death. A 5-year-old girl fell this morning from the balcony of an apartment on the ninth floor of a residential building on Ichilov Street in Netanya. MDA teams who were called to the scene found the girl suffering from severe systemic injury and without vital signs, and were forced to determine her death. Police also arrived at the scene and began investigating the circumstances of the girl's death. MDA paramedic Rafi Sheva noted, "This is a terrible tragedy. When we got to the building, we saw the girl lying unconscious in the parking lot, suffering from a very serious injury. We carried out a number of medical examinations, but she had no vital signs, and we had no choice but to determine her death at the scene." 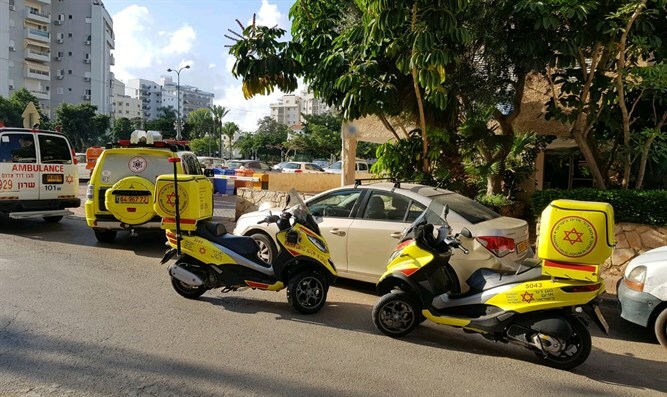 Daniel Yechiel, a medic for United Hatzalah, said: "Together with other paramedics living nearby, we came immediately and encountered a girl who suffered from a severe systemic injury after falling from the balcony of her home."